New Orleans is nearing its tricentennial (that’s right, that means 300 years, significantly older than the ol' USA), which means that it’s got its fair share of history. And although some of that history has been burned or drowned or torn down and rebuilt, you can still eat and drink some of it by visiting certain illustrious establishments. If you’re looking for a historic meal or tipple in NOLA, here’s a good guide to some of the oldest joints in town still operating today. 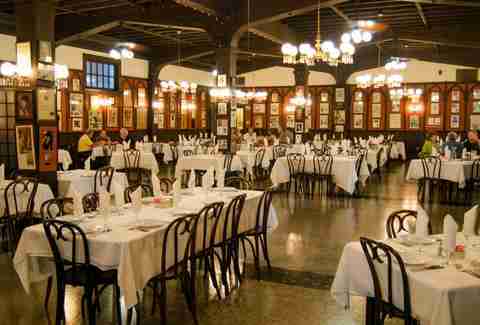 At 175 years young, it’s pretty impressive that Antoine’s hasn’t lost its Old World continental elegance. 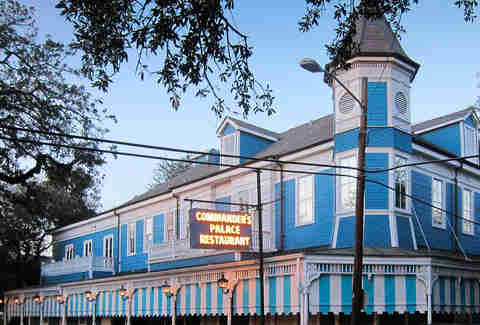 The restaurant moved to its current location on St. Louis Street in 1868, but nothing was lost in transition, with the kitchen whipping up its signature, quintessential Creole fine-dining fare to this day. Having dinner at Antoine’s is like stepping into a time warp, in the most joyous of ways, especially in the jaw-dropping Rex Room. 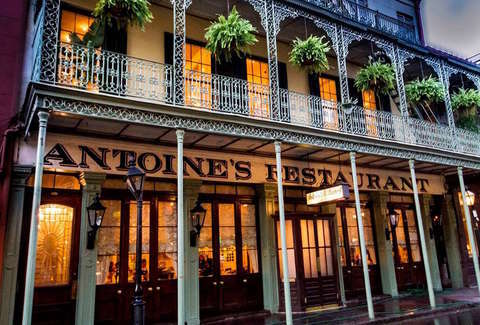 Like Antoine’s, Arnaud’s stands at the forefront of Creole Grande Dame fine-dining establishments. Aside from being a historic (and tasty) place to eat and drink, it also houses a Mardi Gras museum gallery, as well as -- rumor has it -- several ghosts. 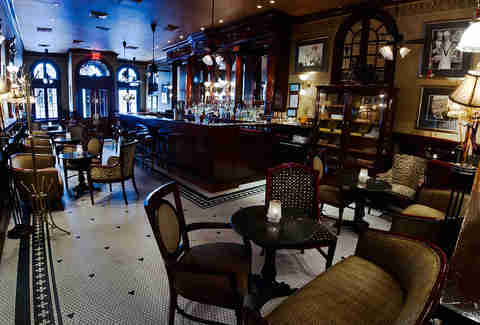 Also, the historic French 75 Bar is a magnificent place for a cocktail, at the hands of master bartender Chris Hannah, and the soufflé potatoes need only be tasted to be believed. 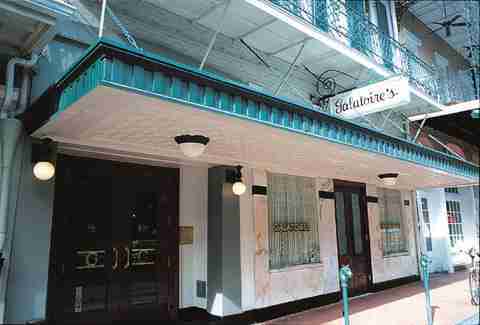 We’ve said it before, but it bears repeating: you haven’t experienced New Orleans unless you’ve experienced a Friday lunch at Galatoire’s, first seating, downstairs. There’s nothing like it in the world. Bonus points for seersucker or white linen when seasonally appropriate, and, if you’re a lady, a fantastic summer hat and pearls. No need to even look at the extensive menu -- let your server guide your meal. It’s pretty difficult to miss Tujague's, with that iconic neon sign illuminating Decatur Street not far from Jackson Square. The brisket with Creole horseradish hasn’t changed a lick for a century, and the famous standing-only bar is the birthplace of the Grasshopper. New Orleans mayor Nicholas Girod famously invited a then-in exile Napoleon Bonaparte to the Crescent City, and if Bonaparte had ever made it off of Elba, it’s possible he would have come to NOLA for good (wouldn’t that have been interesting?). 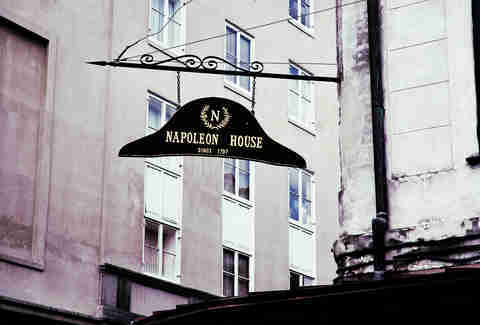 The bar/restaurant that bears Napoleon’s name has, since then, been an excellent place to grab a muffaletta and a Pimm’s Cup, and to enjoy its glorious courtyard basking in the soothing sounds of classical music, the only tunes permitted there. 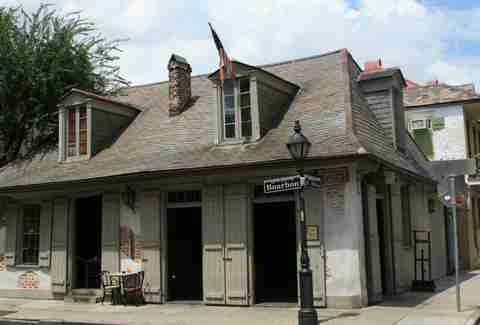 It is one of the oldest standing structures in New Orleans, and the oldest building in the country to house a bar. 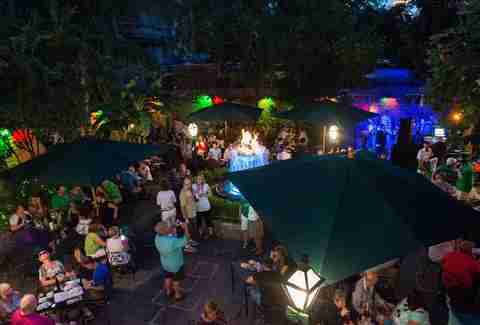 Named after infamous privateer Jean Lafitte, this ancient stone cottage is a must-visit if you’ve never been to NOLA, even though the purple daiquiris (ie. “Purple Drank”) and video poker machines keep the place from seeming too historic. 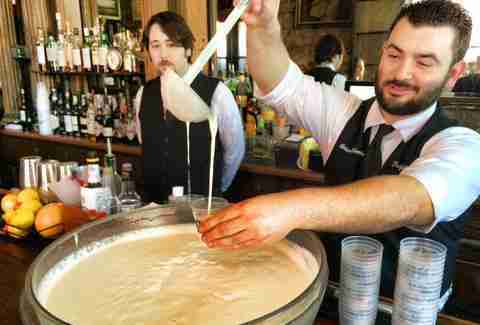 With its beaten copper bar and servers in penguin suits, the Old Absinthe House is unique among its cheesy Bourbon St brethren. 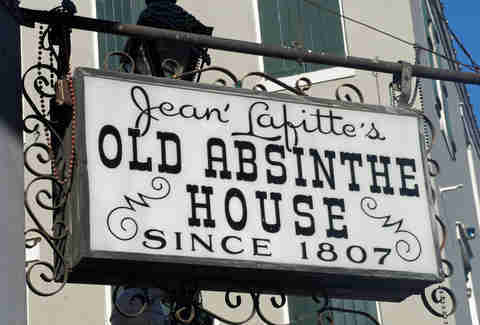 The building housed a coffee shop and other businesses for the better part of the 19th century, before being branded as an absinthe den in 1890, a couple of decades before the “green fairy” was made illegal. 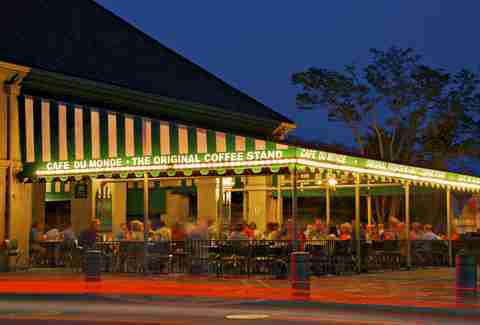 No visit to New Orleans would be complete without at least one visit to Café du Monde, famous home of café au lait and beignets piled eyebrow-high with powdered sugar. Perfect for late-night munchies and morning hangovers (or just, you know, a regular ol' Tuesday), no true New Orleanian will deny this place’s charms. This old Grand Dame lady, situated across from Lafayette Cemetery No. 1 in the Garden District, is pretty hard to miss, being that it’s housed in an historic Uptown mansion and bedecked with a signature baby-blue color scheme. The teams of service make a meal there something of a show (especially if you order the café brûlot), and current chef Tory McPhail is doing an excellent job of playing old favorites while literally bringing new things to the table. It’s hard to kill historic restaurants in NOLA, as evidenced by last year's revival of Broussard’s, yet another of the city’s famous Grande Dame Creole affairs. These days, Chef Neal Swidler, paired with legendary local bartender Paul Gustings, helm the gorgeously renovated and reinvigorated Broussard’s, which is something to see (and something else even better, in which to dine). 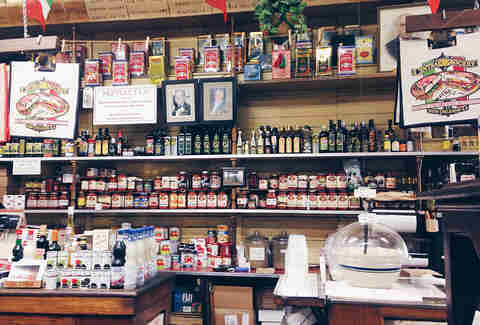 While there might be contenders for the best muffaletta in New Orleans, there is only one original, and that can be found at the Central Grocery, which invented the sandwich in order to sate the palates and nostalgia of Sicilians working in the French market at the turn of the 20th century. Make sure to grab a jar of olive salad to bring back with you, if you’re visiting. 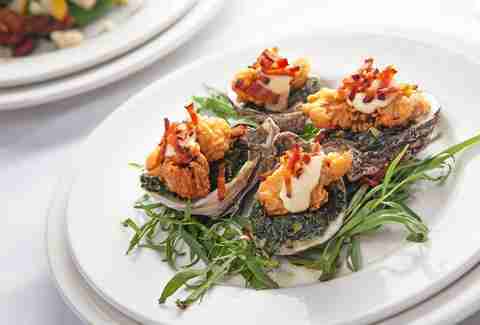 Of all the joints in a town known for their oysters, Casamento’s stands alone. Not only does it have a proprietary stainless steel “oyster box” that keeps its bivalves fresh, cold, and never watered down, it serves a traditional oyster loaf on buttery Texas toast that holds no equal in the Big Easy. It’s closed during the summer, and you will undoubtedly have to wait. But, oh man, is that wait worth it. 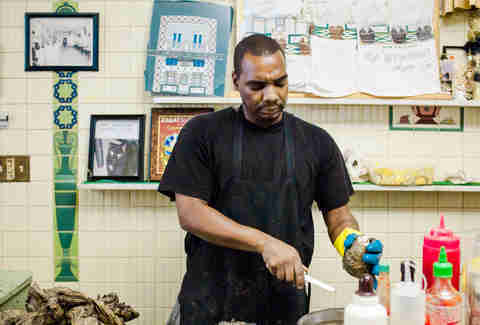 When President Obama wanted a fried shrimp po-boy in NOLA, this is where he went. Regardless of politics, you can’t deny that this was a good choice, as their overstuffed loaves are something of legend. Add a solid helping of roast beef “debris” gravy to your fried seafood po-boy, and you’ll realize why the POTUS needed to check this place out. Recently, the Sazerac was voted into law by Louisiana legislature as “the official cocktail of the City of New Orleans.” And that cocktail, naturally, was born in the bar that bears its name. 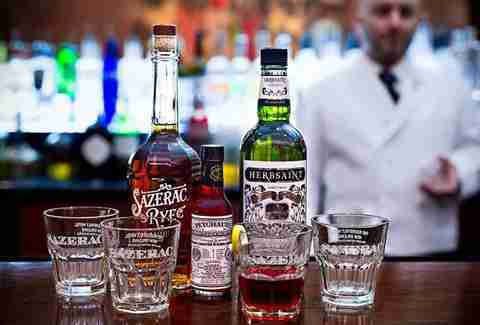 Having a Sazerac at the Sazerac is a bucket list item for any cocktail aficionado. Also, it’s just a good thing to do in general. New Orleans has invented many celebrated cocktails, among them the Grasshopper (see above), the Ramos Fizz, the Brandy Crusta, the Sazerac, and the Vieux Carre. Also, there’s the Hurricane, which was dreamed up by Pat O’Brien at his eponymous French Quarter bar to feature rum during a period in which whiskey was being rationed. It’s still a fine cocktail, and the establishment, with its fire fountains and dueling piano bar, is always a fun experience. One of the few places on this list not located in the Quarter, Henry’s has been pouring them up for thirsty locals for well over a hundred years, and that doesn’t look to change any time soon. Yes, it’s a total old-man dive. Yes, it has cheap drinks, and plenty of them. Yes, you should go there.